Our removals service in London is a one stop shop to make life so much easier for you during your house move. Here at Moving Service, we understand that moving is often a stressful process and the whole relocation thing can just pile up on top of you. And because we understand our own experts have moved at least 5 times in their own life, our removals service is affordable, reliable and efficient to be able to provide you with removal van in Peckham, SE15 to transport all your items to your next place that you’re headed to. Our range of services include home removals as well as furniture removals even right down to office removals, so don’t be shy and give us a call on 020 8746 4402 to see how our team is able to make your move easier! It is a district in South East London situated in the London Borough of Southwark, and it is approximately around 3.5 miles south of Charing Cross. Its nearest surrounding places include Bermondsey, New Cross Gate, Nunhead, Brockley, Camberwell, Walworth and East Dulwich. Transport in this area mainly and heavily relies on buses with two London over ground stations as Peckham Rye and Queens Road Peckham Station. The area has a large bus garage that is currently operated by London Central and is situated on Blackpool road. 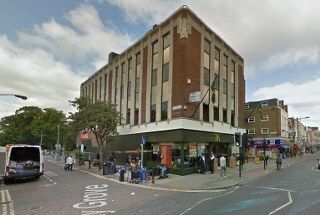 It opened in 1994 and replaced a similar facility on Peckham high street that was there. Since the 1990’s, the European Union has provided funds for regeneration in the area. State funding is being provided to be able to revive the area and renovate the streets. Seen as one of the most ethnically diverse places in the country and in the 19th Century, Rye Lane was considered one of the most important and the largest parks in South of London and is named Peckham Rye Park. The area has been featured in a lot of dramas and documentaries as well in many fictitious books. Based in Peckham, SE15 we at Moving Service know that hiring a local removals company for all your house removal services, is always easier than doing it yourself. With our man with a van services that cover furniture removals, small removals as well as any office removals you may have, we guarantee a fast and reliable service at an affordable rate. Moving a house to SE15 area is already expensive enough, so you don’t need extra charges hence we offer cheap removals and even on the same day. Our experts are qualified to be able to give you and your family the best assistance, ensuring that all your items, goods and belongings reach their new destination, safely. We also offer the service of being able to move items via balconies or windows, if we find that taking it up the stairs or if you live in a narrow flat, may pose a problem leading to problems. Some of our vehicles however do not have any signage, which makes our service discreet and effective, to protect the privacy of clients like you that use us. For more information, please contact us on 020 8746 4402, and discover how we are able to help you move a house, efficiently.